Ah, nightshades... you are so delightfully scary. This picture is blurry because I was whacked out on solanine when I took it. So, of course, once I discovered that the plant was filled with toxic solanine and not at all good for goats to eat... and that the berries, when ripe, are apparently edible by humans (this is good, because I caught the two-year-old with a mouthful and almost had a heart attack)... I became overwhelmed with the desire to eat them. Tentatively, after watching the plants for a while to make sure they wouldn’t bite me, I ate the first few ripe berries. No nausea, no dilation of my pupils, no burning in my mouth or throat, and no visions of 40-foot-tall vampire bats. So far, so good. Plus, they tasted like a cross between a berry and a tomato. Really nice. A day or two later, I ate some more. No problem. 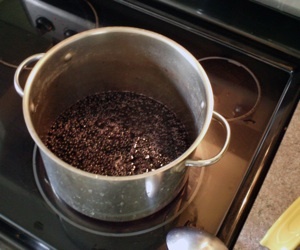 Then, since I was still alive and knew the berries actually tasted good, I did what any good survivalist with a daredevil personality, a distinct Betty Crocker gene, and a predilection for toxic plants would do: I made jam. You can too. 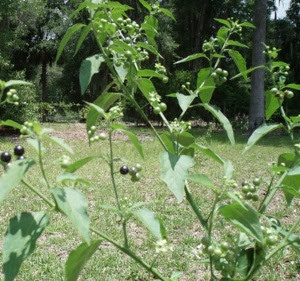 Just don't get this plant mixed up with deadly nightshade or you'll totally die. Heck, you might die doing this. NOTE: Don't blame me if you die. This post is for entertainment purposes only. Any resemblance to anything scientific or safe is purely coincidental. FURTHER NOTE: If you go ahead and eat these, despite my warnings, watch out for bitter berries. If you pick some fully ripe ones off a plant and they taste bitter, instead of pleasant, don't eat them and don't harvest from that plant. 1. Pick 1.5 lbs of dangerous nightshade berries. 2. Boil them with about 1/3 cup sugar and a tablespoon of lemon juice. Mash the berries as you go. 3. When the jam sets nicely on the end of a chilled spoon, you’re ready to jar them. 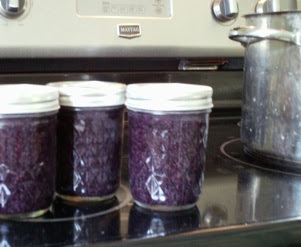 Follow whatever canning directions you have for jam, and boiling-water can the tasty purple stuff. If you’ve got more berries, make more jam. It’s delicious. I wouldn’t eat too much, though, because of death. Fortunately, solanine poisoning generally exhibits itself with nausea long before you reach a fatal dose. And boiling doesn’t destroy solanine, so just bear that in mind. Seriously laughing out loud . . . and seriously would never eat these. You are one toxic berry away from crazy! Just kidding - I admire your adventurous spirit. 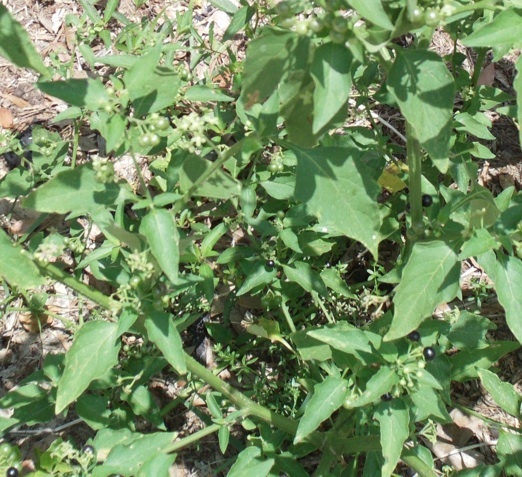 Here in Los Angeles we have, according to the Experts, another species--Solanum douglasii--though I'm not sure I could recognize the difference from any other species of black nightshade, of which I understand there are several. The plants look similar to tomato plants, and the flowers look like tomato flowers. Anyway, I often eat ripe berries raw--they taste like tiny tomatoes, only sweeter--and have made a black spaghetti sauce, replacing tomatoes with nightshade berries when I could find enough in my back yard at one time.